Beltrac® 3000 retractable stanchions are the perfect choice for waiting lines, crowd control management, and queue systems. The continuous aluminum extrusion provides superior strength and rigidity to withstand the most extreme environments. The belt extends to 7 feet. The 14” sloped base is stylish, yet underneath the surface sits a solid, 18 lb. cast-iron foundation that offers best-in-class stability and longevity. Add to that the original Beltrac 4-way dovetail grooves that allow quick and easy access to in-line merchandising solutions and you have more than just a retractable belt stanchion – you have a crowd management and queue system that the world’s largest companies have relied on for decades. The advanced retractable belt mechanism has a unique, centrifugal belt-braking system that ensures a slow and safe retraction. The superior steel stanchion base is weighted for superior stability. The factory-applied, slotted rubberized base protects flooring and promotes air flow, allowing wet floors to dry quickly. The wrinkle black post is the lowest cost choice; the gold post is the highest cost choice. WRINKLE BLACK, SATIN and CHROME have THREE-DAY lead times for shipment, the GOLD takes longer. Many belt color choices. Custom colors are also avail, as per the custom color chart. Contact U.S. Bank Supply at 805-218-6106 or email us at orders@usbanksupply.com if you are interested in a custom color. There is a one-time set-up charge of $43.20 for these colors. Premium Barrier Post • The original 4-way connection remains the best, allowing a simultaneous connection of up to 4 belts or accessories. • One-piece post construction provides superior strength. • Post can receive all major manufacturers' belts. 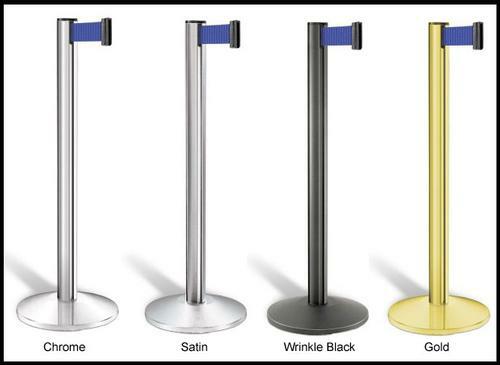 Beltrac 3000 stanchions with retractable 7 ft. belts for lines, crowd management, and queue systems. Continuous aluminum extrusion provides strengt, rigidity to withstand extreme environments.